The LevNet RF™ Decora® Rocker 902MHz Wall Switch Receiver (WSS20) features a robust rocker (return-to-neutral) manual switch used to toggle the lighting load ON or OFF. Using EnOcean® technology, but upgraded to the proven 902MHz radio frequency, the WSS20 leads the industry in quality and reliability. The WSS20 is compatible with all Leviton 902MHz EnOcean-enabled self-powered transmitters. The WSS20 is the optimal solution for retrofit applications where incandescent, fluorescent and low-voltage lighting controls are required. 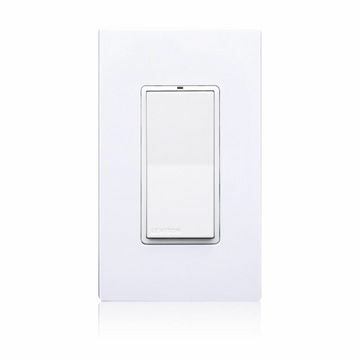 The WSS20 replaces a traditional single-pole wall switch and fits in a standard single-gang wall box. No additional wiring is required.